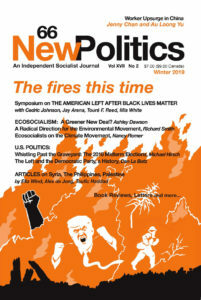 WADOOD HAMAD's "Unraveling Iraq: The Sociopolitical and Ethical Dimensions of Resistance" appeared in New Politics 38 (Winter 2005). Iraq, as one long conversant in its fervent political history remarked to me, is much like the earth resting underneath a giant rock laid there for a very long time. The U.S.-led invasion of 2003 destabilized — if not moved — this rock and unleashed a multitude of organisms that were unknown even to local residents. Struggling for Progress, in Iraq! The current armed insurgency in Iraq, erroneously portrayed by some as "resistance" to U.S. occupation, does not — nor could it ever — represent a national resistance movement. While it is true that the medley of insurgents espouses "a mixture of Islamic and Pan-Arab ideas," it is inaccurate to insinuate that they "agree on the need to put an end to U.S. presence in Iraq." For if this were true, why are those elements not fighting U.S.